In this insightful book, Dr. Markham draws on scientific research to craft smart strategies that any parent can use to help their children resolve their conflicts with empathy, mindfulness and peace. A must-read for every parent. Are you in the UK, India, Australia or anywhere else served by Amazon.co.uk? The British publisher has renamed the book Calm Parents, Happy Siblings -- but it's the same book! Or click below to order the US version shipped free anywhere in the world from the Book Depository. Click here to buy the book on Amazon.co.uk. I'm convinced that if every parent took the time to read her books, the world would be transformed. Seriously. I'm not exaggerating, her peaceful parenting concepts are transformative....Dr. Markham's approach is about being the parent you want to be: about raising happy, responsible, emotionally healthy children; and about the revolutionary idea that love and relationship are at the heart of parenting. As a parenting coach, I know that sibling struggles can be heart-wrenching for parents. Dr. Laura's strategies are right on the money to help today's parents create more peaceful homes - and stronger sibling relationships. Great work! Parents need all the help they can get to be the kind of parent they want to be, and to use parenting skills that influence their children to be good citizens of the world. Dr. Laura's book is filled with this kind of help—practical, inspiring, and encouraging though real-life examples. It would have helped me a lot when I was raising my children. Finally, a book that answers your questions around sibling rivalry! In this insightful book, Dr. Markham draws on scientific research to craft smart strategies that any parent can use to help their children resolve their conflicts with empathy, mindfulness and peace. A must-read for every parent. This book walks parents through sibling scenarios—even ones for very intense children—and breaks down the specifics of how to approach common struggles, without making parents feel guilty or overwhelmed. It is a wonderful resource that gives parents the tools to not only help our children while in the midst of conflict, but also helps us to teach our children how to be the loving, kind and respectful brothers and sisters we know they can be. Brothers and sisters rejoice! Here's a family roadmap to transform bickering kids into a connected sibling team. One third of kids have a warm caring relationship with their siblings. Read this book and your family can join the ranks. Whether you are just beginning to contemplate having a second child or you are already frustrated by nonstop sibling fighting, this book is for you. I marveled at the amount of wisdom, compassion, and practical ideas packed into its pages. The wisdom begins with her gentle reminder that we have to start with ourselves if we want to make meaningful changes in our children's relationships with each other. The compassion is in Dr. Laura's empathy for everyone in the mix—including angry and worried parents. And the ideas aren't just practical and usable—many of them are downright fun. You'll laugh out loud just reading them, and everyone will laugh when you try them out. Wouldn't that be a nice change from bickering and clobbering? Refreshingly positive and respectful in its tone, Peaceful Parents, Happy Siblings lovingly guides parents by using scripts and practical examples, essential tools for any parent with more than one child. Dr. Laura's compassionate approach is empowering for parents, and liberating for children. Dr. Laura's examples and coaching-based methodology make parenting siblings far less daunting....Her book reassures us that doing our best with the right tools, including self-regulation, connection, and coaching, can build a much happier and more peaceful family. Adding a child to the family creates a cascade of challenges. Dr. Laura Markham shows parents how to avoid common sibling difficulties, and how to convey their love, even in stressful situations, so children truly feel supported. Open this book, and you'll find clarity, wisdom, workable ideas, and generous helpings of respect for parents and children. A phenomenal book for parents with multiple children! Dr. Markham addresses all of the common sibling issues with sensible solutions to bring peace and foster healthy relationships between siblings. This book will be my constant companion for years to come. If you are the parent of more than one child, this is the book for you. Laura Markham begins at the beginning — the how and when to tell your child that they are about to become a big brother or sister — and then offers concrete suggestions to help you lay down the foundation for a healthy sibling relationship throughout your children's lives. I know that I will highly recommend this book to all my clients. This book delivers hope and help. Laura Markham brilliantly applies her respectful, attuned, limit-setting approach to sibling dynamics. Full of realistic scenarios and scripts for how parents can turn conflict into opportunities to build skills, and turn parental dread into meaningful intervention. 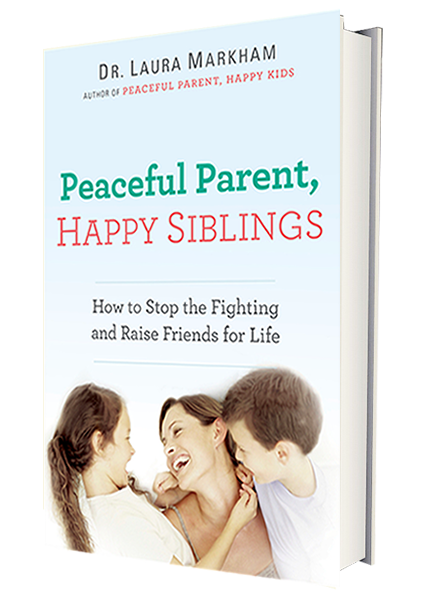 Peaceful Parent, Happy Siblings masterfully coaches parents on how to honor each child's experience, set limits, reduce conflict, and build skills for life. I am a SAHM to two boys, ages 4 1/2 and 18 months. I first found Dr. Markham when my youngest was about 10 months old and some major sibling issues reared their ugly head. I cannot say this enough: Her book, "Peaceful Parent, Happy Siblings" was a LIFE CHANGER. I couldn't believe the incredible results I got from putting her advice and strategies into action. I put if off because I was too darn tired from sleepless nights to take on the task of reading another book. But the beauty of this book is that the layout of it makes it possible to start immediately. I highly recommend it. Shout out to Dr Laura Markham for transforming my kids' relationship, with her book Peaceful Parent, Happy Siblings! Peaceful Parent, Happy Kids is invaluable. But Peaceful Parent, Happy Siblings takes it to the next level and makes it all come alive so vividly. The scripts are so helpful and make it all so real. There's a great overview/explanation of how family emotions work and how you, as the parent, are the model and coach. I love the list of what children learn when parents allow the child's feelings and respond with empathy! This book is absolutely phenomenal! This book has completely changed the dynamic between my three children. If you have more than one child, get your hands on this book. You will be so glad you did. If you know anyone who is expecting a second child, give them the best gift they will get-- a copy of this book. They will be forever grateful. Thank you, Dr. Laura. Just fantastic!! The book gets better with every chapter! Loved the 7 categories of bickering and the concept that fighting can be a GOOD thing because it teaches conflict resolution and problem solving. LOVE the section on apologizing. LOVE all the scripts!! What a great coach Dr. Laura is...she really understands the challenges of being a parent and gets what we go through! As any parent of more than one child knows, it’s challenging for even the most engaged parent to maintain a peaceful home when competition, irritation and tempers run high. In this highly anticipated guide, Dr. Markham presents simple yet powerful ways to cut through the squabbling and foster a loving, supportive bond between siblings. You really can stop the fighting and raise children who will be friends for life. Creating deep connections with each one of your children, so that each truly believes that you couldn’t possibly love anyone else more. Fostering a loving family culture that encourages laughter and minimizes fighting. Teaching your children healthy emotional self-management and conflict resolution skills—so that they can work things out with each other, get their own needs met and respect the needs of others. Helping your kids forge a close lifelong sibling bond—as well as the relationship skills they will need for a life of healthy friendships, work relationships, and eventually their own family bonds.